The first event established the international presence of the Brazilians in a movement that was found rather than founded as its members gradually discovered each other, and that culminated (and ended) in the publication of several international anthologies in the late sixties and in a number of exhibitions, including a month-long “expose: concrete poetry” at Indiana University in 1970. (1) The second event had no international repercussions but turned out to be of considerable significance for the Brazilian cultural scene of the day. It established the label “Concrete Art,” and with it “Concrete Poetry,” in the public mind. It was apparently the first exhibition in Brazil where paintings, sculptures, and poster poems were exhibited side by side. It thus gave visitors an opportunity to explore the features that prompted visual artists as well as poets to use the same label for their work – a challenge that has gone largely unheeded, even though many of these works were reunited in memorial exhibitions in 1977,(2) in 1996, (3) in 2002, (4) and in 2006. It was the first – and for a number of years the only – time when artists belonging to two groups, one from São Paulo, the other from Rio, all of them engaged in developing a constructivist, abstract-geometric art which they now decided to call “Concrete” (as opposed to “Abstract”), exhibited their work together, ten artists from each camp. (6) The three Noigandres poets from São Paulo, Décio Pignatari and Haroldo and Augusto de Campos, were joined by three “Cariocas”, Wlademir Dias Pino, Ferreira Gullar, and Ronaldo Azeredo. Not long after, the artists and poets from Rio decided to break with the Paulistas for ideological reasons and declared themselves to be “Neoconcretos”, except for Ronaldo Azeredo who had already joined the Noigandres group (and was followed a little later by another Carioca, José Lino Grünewald). The exhibition was, finally, also the place to reaffirm the claims by all involved to represent the avant-garde in poetry and the visual arts, a claim already announced by the titles which the groups of artists had chosen for themselves at their foundation in 1952: “Ruptura” and “Frente”. Fig. 1: Waldemar Cordeiro (1925-1973), Movimento (Movement), 1951. 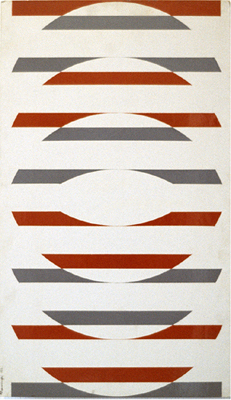 Luiz Sacilotto’s Concreção (1952; fig. 2). Fig. 2: Luiz Sacilotto (1924-2003), Concreção (Concretion), 1952. Oil on canvas, 50 x 70 cm. São Paulo: Coll. Ricard Akagawa. and Desenvolvimento de um quadrado and Movimento contra movimento by Geraldo de Barros (both of 1952; fig. 3). Right: Movimento contra movimento (Movement against Movement), 1952. Enamel on kelmite, 60 x 60 cm. Switzerland: Coll. Fabiana de Barros. The reference to time or movement in the titles that is characteristic of Ruptura work, as well as the use of industrial media such as enamel or lacquer and of industrial board (kelmite or eucatex) for the support, are also found in Objeto rítmico No. 2 (1953; fig. 4) by Mauricio Nogueira Lima, who joined Ruptura in 1953. Fig. 4: Maurício Nogueira Lima (1930-1999), Objeto rítmico No. 2 (Rhythmic Object No. 2), 1953. “Pintura” on eucatex, 40 x 40 cm. São Paulo: Coll. Luiz Sacilotto. Fig. 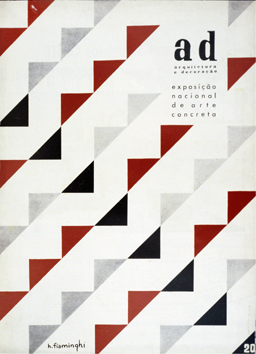 6: Cover, ad: arquitetura e decoração (São Paulo), No. 20, December 1956. Movement), 1956. Enamel on eucatex, 60 x 60 cm. São Paulo: Coll. Ronaldo Azeredo. 49.3 x 49.2 cm. São Paulo: Museu de Arte Contemporânea, USP. Curves), 1956. Enamel on eucatex, 60 x 60 cm. and by Alexandre Wollner, a close associate but never a Ruptura member (fig. 10). 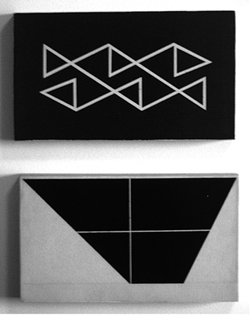 All three are based on the square, the preferred shape for much of the work by the Ruptura artists at the time (cf. figs. 3, 4, 7, 12, 14, 26); all three confirm the tendency of these Concrete artists’ designs to use “variation” and “development” of lines and shapes by systematically altering their size and thus achieve implications of a temporal dimension and the illusion of moving into the depth of the field. Alfredo Volpi, thirty years older than most of the others and now counted among the very great in Brazilian art, was for a number of years drawn onto the Concrete path. In his Xadres branco e vermelho (fig. 11) he introduced into a static, flat, decorative red-and white checkerboard pattern a dynamic ambiguity by splitting diagonally descending squares diagonally into halves of opposing colors, which inverts the pattern below the diagonal and altogether confuses one’s optical orientation – which is only one of the consequences of this simple intervention, more difficult to verbalize than to grasp visually. 1956. Tempera[?] on canvas, 53 x 100 cm. São Paulo: Coll. João Marino. 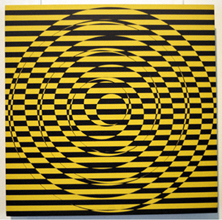 A black-and white reproduction of Volpi’s painting was reproduced in the ad catalogue, and so was Mauricio Nogueira Lima’s Triângulo espiral (fig. 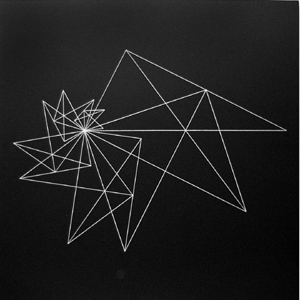 12), a black square in which a set of interlocking triangles follows a systematic pattern of development that imposes a rotation either inward to the left, with regular diminutions, or outward to the right, with the triangles increasing, so that the spiral movement may suggest either an implosion or an explosion. Fig. 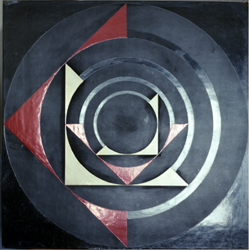 12: Mauricio Nogueira Lima, Triângulo espiral (Spiral Triangle), 1956. Paint on eucatex, 60 x 60cm. A striking example of the use of industrial material with a suggestion of manufacturing processes was Sacilotto’s Concreção 5624 (fig. 13);(13) its uneven surface resulting from pasting on identical small aluminum squares in a rigorous pattern introduced into the monochrome work a play of light and shadows that changed with the position of the observer. 36.5 x 60 x 0.4 cm. Coll. Renata Feffer. 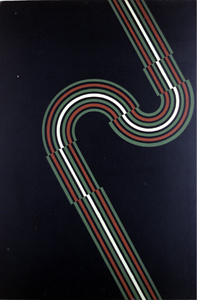 The impersonality of their work of the 1950s made it at times difficult to recognize authorship, but – as these examples will have demonstrated – differences existed and would eventually become more pronounced; however, for a number of years the members of the Ruptura group adhered quite faithfully to their program The materials of their paintings (straight or curved lines, geometric shapes, a few carefully balanced colors used for structural effect) were reduced to a minimum; all signs of individual production, such as brushstrokes, were eliminated. The only self-expression they permitted their work to show was the expression of their particular way of visual thinking and of the ways in which they conceived and executed “visual ideas.” Every work followed a clear plan which could be formulated as verbal instructions to be executed by someone else; and a realization of the rules governing each “visible idea” was a necessary part of the viewer’s experience and understanding. 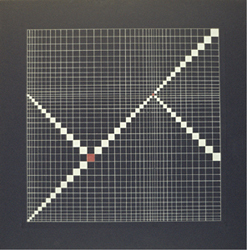 In the case of Cordeiro’s painting shown in figure 14 we see two sets of angled straight lines, one in red, the other in black, placed so asymmetrically that they hardly invade the left half of the white square, but with the implied movement producing a sense of visual balance. The black lines function as it were in counterpoint to the mechanically regular progression of the identical angular lines in red, except for the reverse angle in the final line that braces the movement; yet the effect on the perception and visual imagination is not mechanical at all. Spatial relationships become ambivalent, and a major characteristic of this minimalist work is its rhythmic dynamism. No matter what the merits of this criticism, both their work and their theoretical statements confirm the affinities between the Noigandres poets and the Ruptura artists. Cordeiro met Décio, Haroldo and Augusto in November 1952, when they had just published the first issue of Noigandres with their recent poems and the Ruptura artists were about to open their exhibition. I do not know much about the intensity of the contacts in the years before the National Exhibition, but some of the Ruptura members have been called “interlocutores constantes” with the poets. In 1953 Décio and Cordeiro traveled together to Chile to participate in the Continental Culture Congress, a trip financed by the Brazilian Communist Party. But then Décio left to spend two years in Europe. In his absence, Haroldo and Augusto published Noigandres 2 (1955), all of one-hundred copies, made expensive because of Augusto’s six multi-colored Poetamenos poems which he had composed as early as 1952/53 and which are rightly considered the first Brazilian Concrete poems. All of these poems are inscribed in invisible squares. All contain at least two colors, with the sixth, “dias dias dias,” displaying all of the primary and secondary colors as well as lower-case and capital letters. Inspired by the composer Anton von Webern’s theory and practice of Klangfarbenmelodie,(18) published. (19) The most frequently discussed poem is “lygia,” reproduced and analyzed (again) in Marjorie Perloff’s essay; I have shown elsewhere, following Augusto’s own lead, that the poem is in fact (among other things) a transposition of the opening measures of Webern’s Quartet for Violin, Clarinet, Tenor saxophone and Piano, op. 22 (Clüver, “Klangfarbenmelodie”). In the newspaper articles Augusto and Haroldo began to publish in 1955 there was apparently no reference to Brazilian Concrete art. 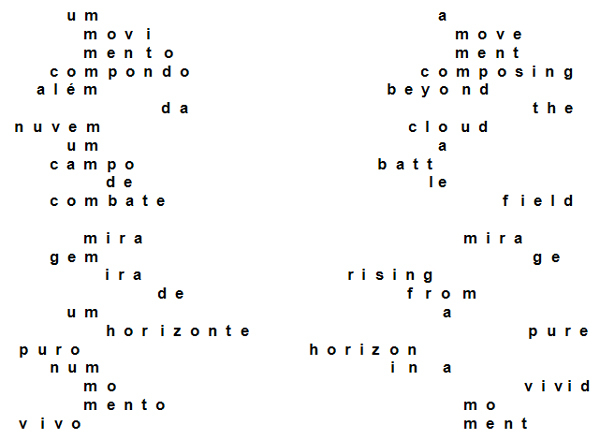 When the “plano-piloto da poesia concreta” (Pilot Plan for Concrete Poetry), the condensed summary of the theoretical statements composed by the two and Décio over the past four years and published in 1958 in Noigandres 4, defines Concrete poetry as “tension of word-things in space-time” and lists parallels in music and the visual arts, it refers to “mondrian and the boogie-woogie series; max bill; albers and the ambivalence of perception; concrete art in general.” It is difficult and also rather pointless to speculate on the effect the personal contacts may have had on the thoughts and the work of poets or painters during the years leading up to the National Exhibition. But the affinities are obvious. In hindsight, considering them from the “orthodox” (or “heroic”) phase that their work had reached with the poems published in Noigandres 4, Augusto’s Poetamenos poems still show a number of characteristics that were later eliminated (which, for some readers, may make them more interesting and appealing). There is still a lyrical “I” present – in fact, in terms of referential content they are a kind of Erlebnislyrik. The fifth poem, “eis os amantes,” using a more reduced verbal material and approaching the isomorphism so strongly emphasized in the “Pilot Plan”, indicates most clearly the path future developments will follow. from Solt, ed., Concrete Poetry, recto of inside cover page. and Mary Ellen Solt , from Solt, ed., Concrete Poetry, verso of inside cover page. Originally published in the complementary colors blue and orange,(20) it was placed in white and orange within a blue square for its publication in Mary Ellen Solt’s Concrete poetry anthology (fig. 15a), with the English translation appearing in blue and white in an orange square (fig. 15b). 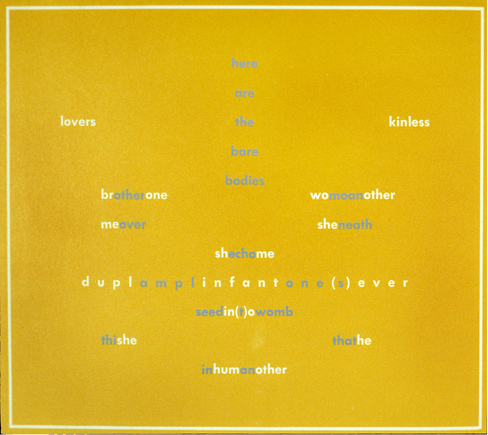 (21) The semantic representation of the sexual union of two lovers, culminating in the long portmanteau word in the center and the final verbal fusion of one in the other continuing the “infant” motif, is visually shown by the placement, approximation, intertwining and crossing of the two colors. 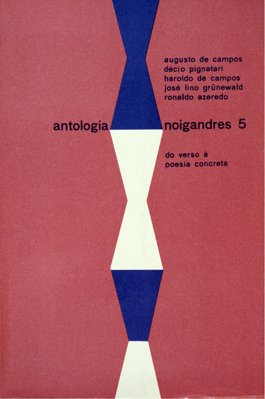 Noigandres 3 was published on the occasion of the 1956 exhibit, with poems by Décio Pignatari, Haroldo and Augusto de Campos, and Ronaldon Azeredo. Pignatari’s “um movimento” was also included in the ad catalogue as a typewritten text. I reproduce it below with an attempt at a translation that makes compromises in order to somehow preserve its most salient features. It is (still) a syntactically coherent statement complete with a verb (a participle, “compondo”) and separated by an empty line into two stanzas. But the most striking feature is the column of m’s in the center (making it into a kind of Mittelachsengedicht), which emphasizes its spatial properties and invites the exploration of other vertical relations and internal visual structures. The entire shape suggests an iconic relation to its semantic content, a (metaphoric?) landscape or cloudscape, which moves from “a movement” to “a moment”, with “horizonte” representing the most prominent horizontal feature. There is still an implied observer and therefore the expressed presence of a consciousness. Fig. 16: Décio Pignatari (b. 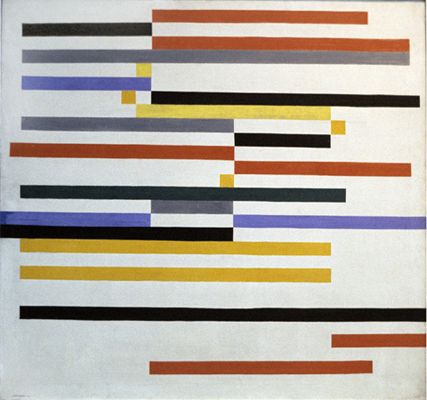 1927), “um movimento,” from Noigandres 3, 1956; English version: Claus Clüver. in Solt, ed., Concrete Poetry, np. The poem was originally published in black on a white page; the version shown here, which shows the letters in white inscribed in a dark blue square, visually evokes a stellar constellation, in keeping with part of the dominant imagery. This iconic emphasis may subdue other implications and associations evoked by the text; but Augusto has agreed that a white-on-black reproduction may be appropriate (just as two of Haroldo’s contributions to Noigandres 3 offered a white text against a black ground). Fig. 18: Cover of Noigandres 4, 1958; design: Hermelindo Fiaminghi. Fig. 19: Haroldo de Campos (1929–2003), “nascemorre,” Noigandres 4, 1958.
and a structurally designated vertical axis formed by carefully aligned “re”s; a shift of the second triangle by one slot to the left (as it has happened in the fine anthology organized by Mary Ellen Solt) not only removes that axis but violates the structural feature of vertically aligning all e’s of the text except for those of the initial and final “se.” Altogether the poem exhausts all the possibilities inherent in its semantic properties as well as of the visual arrangement of its triangles. The final syllable (an echo of “nasce”) returns us to the beginning in an endless progression of dying and becoming. 60 x 120 cm. São Paulo: Pinacoteca do Estado. obviously have a different motivation and function than those in Haroldo’s poem, where each triangle manifestly performs the act of “becoming” signaled by the verbal semantics and the “death” of the first triangle leads to its “rebirth” in the second and the inversion of the second also inverts the meaning of the verbs: “desnasce” equals “morre.” On the other hand, as I hope to have shown, the similarities between the work of both groups in their orthodox Concrete phase reach significantly deeper. Fig. 21: Ronaldo Azeredo (1937–2006), “ruasol,”, Noigandres 4, 1958. The most rewarding way to read the poems under consideration here is to approach them as metapoems – which in this case includes the observation that “ruasol” is intranslatable, because only Portuguese uses three letters to form each of the two nouns signifying “street” and “sun.” An effort to understand how the text functions is very similar to the effort of understanding a Concrete painting or sculpture. Two simple, formal transformations of a commonplace generate some very complex possibilities for meaning making. First, by violating the syntactic closure of the phrase “vai e vem” with a repetition of the “e” at its end, a regular verbal pattern is created that can go on indefinitely: ABA becomes ABAB. Second, by giving this syntactic alteration a graphic statement that connects beginning and end, the way in which the now endlessly repeating phrase signifies is radically altered: it becomes an ideogram. This ideogram, however, is quite different from those in current writing systems that have become as conventional as letter-based ones. The poem generates its own rules for making meaning because, as an ideogram, it can only be understood as a graphic violation of the linear, cumulative signifying conventions of language. Fig. 22: José Lino Grünewald (1931–2000), “vai e vem” (1959), Anthologia Noigandres 5, p. 181. Fig. 23: Cover, antologia noigandres 5, 1962. Fig. 24: Alfredo Volpi, 1960, Coll. D. Pignatari. Fig. 25: Mauricio Nogueira Lima, 1953., Coll. D. Pignatari. Fig. 26: Hermelindo Fiaminghi, 1956., Coll. D. Pignatari. Fig. 28: Luiz Sacilotto, 1958, Coll. Ronaldo Azeredo. Fig. 29: Mauricio Nogueira Lima, 1960. Coll. Ronaldo Azeredo. Augusto owned a painting by Sacilotto that I did not photograph; Haroldo’s living-room wall was full of paintings, but there my son filmed while I was taping my interviews, and so I have no slides. I have limited my remarks to the decade surrounding the National Exhibition and to the relations of the Noigandres poets to Concrete art produced in São Paulo. 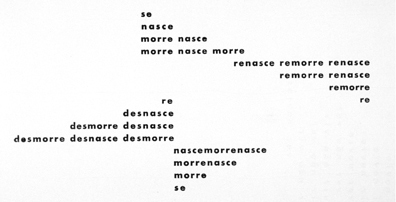 The Noigandres model induced the production of Concrete poetry in other parts of Brazil. As has already been suggested, the relations between the Noigandres poets and the two poets from Rio who were to be involved in “Neoconcretismo” became complicated in the late fifties, and so did the relations between the two groups of visual artists. In fact, the groups disbanded as such, with the most prominent Frente members exhibiting for a while under the banner of “Neoconcretismo.” Indeed, Lygia Clark, Lygia Pape and Hélio Oiticica followed divergent paths that distinguished their later work significantly from that of the Paulistas. Fig. 30: Franz Weissmann (1911–2005), Coluna (Column), 1958. 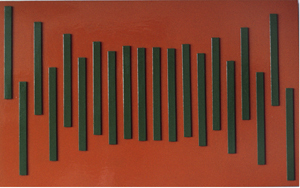 Painted iron, 280 x 110 x 75 cm. São Paulo: Museu de Arte Contemporânea, USP. Photo: Claus Clüver, 1977.
squares rather than on their sides, the new column was lighter and less austere. 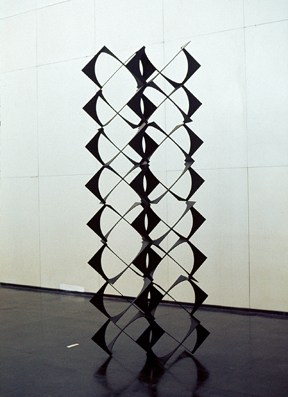 The basic idea on which the column is built is also found in another sculpture displayed in the 1977 exhibit, Três pontos (fig. 31). The artist told me in an interview in 1981 that he had hoped to see it placed, in a larger scale, in the center of Brasília, to symbolize the interplay and intricate balance among the three branches of government. 120 x 160 x 160 cm. Photo: Claus Clüver, 1977. 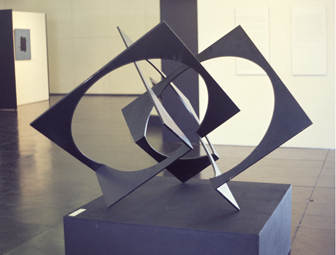 The sculpture that stood at the entrance of the exhibit in Rio de Janeiro’s Museum of Modern Art, Weissmann’s Círculo inscrito num quadrado (fig. 32), shows one of the simplest forms of the idea of creating interlocking squares out of flat sheets of metal and “inscribing” in them circles by cutting them out; here, the squares rest on their sides. (Circle Inscribed in a Square), 1958. Painted iron, 100 x 100 x 100 cm. Photo by Claus Clüver. Amilcar de Castro’s work is characterized by a seemingly intuitive approach and the great simplicity by which he creates spatial configurations by cutting and bending “flat” circular (fig. 33) or square (fig. 34) steel plates. I first saw a display of some of his sculptures in 1976 in Belo Horizonte, Minas Gerais. I could not locate images of these in the lavish book on the artist by Ronaldo Brito, but it contains reproductions of work done in the 1960s and even in the 1950s that is very similar to the sculptures shown here. 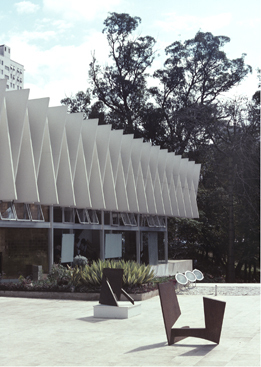 Palácio das Artes in Belo Horizonte, Minas Gerais, in 1976. Photo by Claus Clüver. The work of both sculptors clearly shares the Concrete aesthetic exemplified by the paintings, sculptures, and poems shown in the National Exhibition of 1956/57. It was not even then a unified aesthetic, and the rupture between Cariocas and Paulistas that was to occur soon after and to turn into a split between Concrete and Neoconcrete art (and poetry) brought into greater relief what an attentive observer like Mário Pedrosa noted right away. But much of the public reaction involved an attempt to come to terms with the radical break with tradition perceived in all of the work, and most specifically in the poetry, because constructivist visual art produced in Brazil had already been in the limelight at least since the First São Paulo Biennial of 1951. This essay has focused on the interrelations between the work of the Ruptura artists and of the Noigandres poets, and on the interactions among its members. As a consequence of the juxtaposition and of the exploration of analogies and similarities, access to these works may have become easier; even nowadays, “reading” these texts – paintings, sculptures, and poems – is still a considerable challenge for many. And the way we read them has changed in the course of fifty years. We are looking back at them with a knowledge of what has been produced since –both by the artists and poets themselves and by the culture that shaped them and that they have shaped in turn. The critical discourse has changed: not only have post-modern notions about the nature and function of art affected the way we approach these visual and verbal texts, but we have witnessed a lively debate about the construction of avant-gardes and neo-avant-gardes based on a well-mapped landscape of the earlier part of the century that may be at odds with the information that was available to the young Brazilians at mid-century. To some degree, the poets have succeeded; they occupy an often privileged position in relevant international anthologies and exhbition catalogues, (31) although many of their manifestos and theoretical statements collected in their Teoria have for the most part remained untranslated. The Ruptura artists have remained almost entirely unknown abroad, for reasons that have little to do with their work and everything with the international art scene. But their impact within the country, along with that of the Neoconcretos, can be assessed by the number of memorial exhibitions I listed earlier, besides a growing number of studies devoted to Brazil’s “Constructivist Project” in general (32) or monographs on individual artists. (33) The publications accompanying and documenting the exhibitions (34) included material about Concrete (and Neoconcrete) poetry; in the monographs the connection between Concrete art and poetry is not a topic. Art critics and historians have disregarded the intermedial and intersemiotic dimensions of the Brazilian avant-garde of the fifties just as much as their literary counterparts. This essay provides no more than a modest orientation. (1). The major anthologies are listed in the Bibliography of Clüver, “Concrete Poetry: Critical Perspectives.” The month-long international exhibition at Indiana University in February 1970 was based on the collection of Mary Ellen Solt, with many contributions by others. Presentations were made by Vagn Steen, Emmett Williams, Iannis Xenakis, Claus Clüver, and davi det hompson. (2).“Projeto Construtivo Brasileiro na Arte (1950–1962),” Rio de Janeiro: Museu de Arte Moderna; São Paulo: Pinacoteca do Estado 1977. (3). In the “Casa das Rosas,” Avenida Paulista, São Paulo. (4). Memorial exhibition “Arte Concreta Paulista” at Centro Universitário Maria Antônia da USP, one section of which was an attempt to reconstruct the “exposição do grupo ruptura no museu de arte moderna de são paulo 1952". Catalogues: Arte Concreta Paulista. 5 vols. São Paulo: Cosac & Naify. (1) Arte Concreta Paulista: Documentos, org. João Bandeira; (2) Grupo Ruptura: Revisitando a Exposição Inaugural, curator Rejane Cintrão, texts Rejane Cintrão and Ana Paula Nascimento; (3) Grupo Noigandres, curators Lenora de Barros and João Bandeira; (4) Waldemar Cordeiro: A Ruptura como Metáfora, ed. Helouise Costa, texts: Helouise Costa and Vivian Boehringer; (5) Antonio Maluf, ed. Regina Teixeira de Barros, texts: Regina Teixeira de Barros and Taisa Helena P. Linhares. (5). See Augusto de Campos, Interview, 2006. The exhibition “concreta ’56: a raiz da forma” was held in the Museu de Arte Moderna of São Paulo from September 26 till December 10, 2006. The impressive catalogue had 311 pages. (6). See the “Appendix” for a list of participants. (7). Unless otherwise noted, all translations are my own. The announcement of the exhibition has been reproduced repeatedly, most recently in Pérez-Barreiro, ed., The Geometry of Hope, 45. The reception of the program is documented in Bandeira, org., Arte Concreta Paulista, 46–51. (8). The images reproduced here are based on slides I took from the originals, the majority at the 1977 exhibition “Projeto Construtivo Brasileiro na Arte (1950–1962)” in Rio de Janeiro, others in the homes of the Noigandres poets, or from documents in my collection. (9). Very perceptively analyzed by Gabriel Pérez-Barreira in The Geometry of Hope, pp. 128–130 (fig. 16); the design has been reproduced on the front of the catalogue’s hard-cover edition as a shape embossed on the uniformly blue cover (replacing the black-white contrast of the original with a figure-ground relationship). (10). 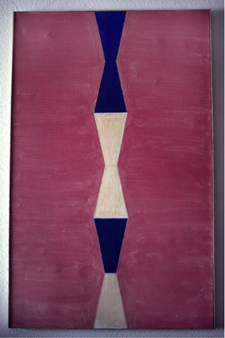 I have analyzed this painting more fully in Clüver, “Brazilian Concrete,” 208–09. (11).This is the title listed in the exhibition catalogue projeto construtivo brasileiro na arte (1950–1962), 14 (where the date is given as 1953, apparently erroneously). In Cabral and Rezende, eds, Hermelindo Fiaminghi, the painting is listed as Círculos Concêntricos e Alternados, dated 1958 But the painting was included in the 1956/57 exhibit; a black and grey version of the design was featured in ad, the exhibition catalogue, entitled “movimento alternado” (n.p.). (12). I have not been in a position to follow up on possible changes in ownership since my 1977 visit in the home of Ronaldo Azeredo. (13). Sacilotto called all of his works at that time “Concretions”, which he dated by year and numbered. (14). The slogan on the back of the invitation to the 1952 exhibit of Grupo Ruptura (reproduced in Amaral, org., Arte Construtiva no Brasil 287). (15). 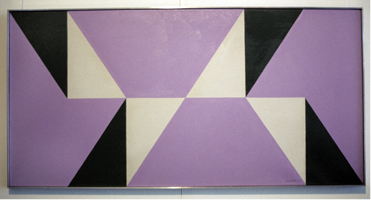 Another version from 1956, smaller and using different materials (acrylic on masonite), is reproduced in Pérez-Barreira, ed., The Geometry of Hope fig. 24, accompanied by an extended analysis by Erin Aldana, pp. 148, 150. (16). Mario Pedrosa, “Paulistas e Cariocas,” 136. (17). Gullar, “Manifesto Neoconcreto,” Jornal do Brasil (Rio de Janeiro), 22 March 1959. (18). Schoenberg’s idea that by changing instrumental or tone color one could produce an effect analogous to the melody achieved by changing pitches was developed more rigorously by Webern in his minimalist compositions. (19). Augusto had circulated them among friends as typewritten copies produced by using colored carbon paper, at the suggestion of Geraldo de Barros (Augusto de Campos, Interview). (21).First published in 1968 as a topical double issue of Artes Hispanicas / Hispanic Arts (1.3-4). (23). H. de Campos had introduced the concept of the “open work of art” with regard to structure and use of materials and the activity of the reader in 1955 (“A Obra de Arte Aberta”), long before Umberto Eco. (24). “É claro que certas características da nova poesia foram levadas por nós até o limite, caso de lemas e temas polémicos como o da “matemática da composição” e do “poema, objeto útil”. Acho, porém, que essa radicalidade foi necessária diante da autocomplacência e do sentimentalismo dominantes em nosso meio. Eu via no “racionalismo sensível” que sustentávamos o ideário da poesia mesma: chegar a produções às quais não se pudesse substituir uma palavra, uma letra, deslocar uma parcela do texto sem que o poema desmoronasse — algo que é afinal a meta de todos os poetas.” Augusto de Campos, Interview, 16 Sept. 2006. (25). See Clüver, “Concrete Poetry: Critical Perspectives,” 271–72. – Like so many of these ideograms, “nascemorre” is built entirely on a linguistic peculiarity (in Portuguese, “nascer” and “morrer” are active verbs, and personal pronouns are not needed) and on a spelling accident: the two verb forms have the same number of letters. Moreover, the final sound of “nasce” happens to equal “se,” and the “re” at the end of “morre” takes on a function of its own. (28).These titles may be part of the polemical opposition of Neoconcretism to Concretism. In the catalogue of the 1977 “Projeto brasileiro constructive” exhibit the work is listed as in the caption. 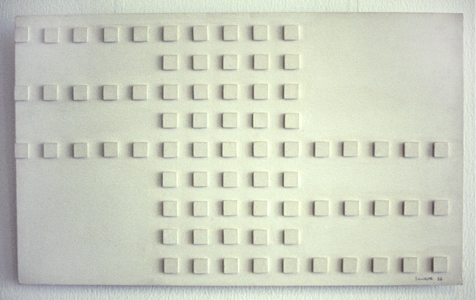 However, Salzstein (90–91) captions the work pictured as Coluna neoconcreta (196 x 76 x 52 cm), MAC, USP; Ribeiro, opposes pp. 28 and 29 a photo of Coluna Concretista (1952–53) with two photos of Coluna Neoconcretista (1958–78, 140 x 50 x 50 cm, no location). 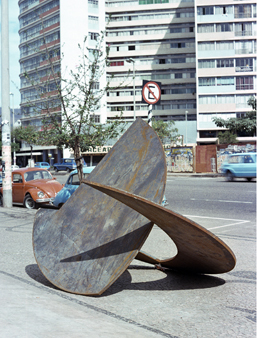 In the MAC’s 1973 Catálogo Gerald as Obras the sculpture shown on plate 147 is listed as Tôrre (Tower; 1957, 169 X 62.7X 37.2 CM). Catalogues of 1988 (Amaral, Perfil) and 1990 (O Museu) list no holdings of a Weissmann work. (but I saw the Coluna there in 1996). (29). 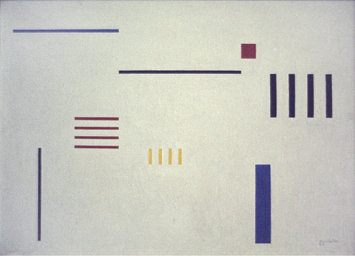 For instance, Haroldo’s poem “mais e menos” was a response to Mondrian’s Plus and Minus; his poem “branco”, which I discussed long ago as an intersemiotic transposition of a Mondrian painting such as Composition in Black, White and Red (1936; see Clüver, “On Intersemiotic Transposition”), turns out to have been conceived as an homage to Malevich. (31). One of the most important is the expansive catalogue Poésure et Peintrie: «d'un art, l'autre», org. by Bernard Blistène and Véronique Legrand, accompanying the exhibit of intermedial poetry held in 1993 in Marseille. (32). See esp. Amaral, Arte Construtiva no Brasil (1998), with an extensive bibliography. (33). See Ana Maria Belluzo, Waldemar Cordeiro: Uma aventura da razão (1986); Isabella Cabral and M. A. Amaral Rezende, Hermelindo Fiaminghi (1998); Ronaldo Brito, Amilcar de Castro (2001); Enock Sacramento, Sacilotto (2001); Sônia Salzstein, Franz Weissmann (2001); Helouise Costa, curator. Waldemar Cordeiro: A Ruptura como Metáfora (2002); Fernando Pedro da Silva and Marília Andrés Ribeiro, Franz Weissmann: Depoimento (2002); André Stolarski, Alexandre Wollner e a formação do design moderno no Brasil (2005). I have listed only monographs about Ruptura artists, besides those about the two sculptors discussed. (34). See Amaral, ed.. Projeto Construtivo Brasileiro na Arte (1977); Arte Concreta Paulista (2002) – one of the 5 volumes is dedicated to Grupo Noigandres, curated by Lenora de Barros and João Bandeira. AD: Arquitetura e Decoração (São Paulo), No. 20 (December 1956). Aldana, Erin. “Waldemar Cordeiro, Idéia visível [Visible Idea], 1956.” In Pérez-Barreiro, ed. The Geometry of Hope, 148–50. Amaral, Aracy, ed. Projeto Construtivo Brasileiro na Arte (1950–1962). Exhibition catalogue. Rio de Janeiro: Museu de Arte Moderna; São Paulo: Pinacoteca do Estado, 1977. Amaral, Aracy, ed. Arte Construtiva no Brasil: Coleção Adolfo Leirner. Portuguese and English. São Paulo: DBA Artes Gráficas, 1998. Arte Concreta Paulista. 5 vols. São Paulo: Cosac & Naify, 2002. See: (1) João Bandeira; (2) Rejane Cintrão; (3) Lenora de Barros and Joo Bandeira; (4) Helouise Costa; (5) Regina Teixeira de Barros. João Bandeira, org. Arte Concreta Paulista: Documentos. Exhibition catalogue, Centro Universitário Maria Antônia da Universidade de São Paulo. So Paulo: Cosac & Naify; Centro Universitário Maria Antonia da USP, 2002. Barros, Lenora de, and João Bandeira, curators. Grupo Noigandres. Exhibition catalogue, Centro Universitário Maria Antônia da Universidade de São Paulo. São Paulo: Cosac & Naify; Centro Universitário Maria Antonia da USP, 2002. Barros, Regina Teixeira de, ed. Antonio Maluf.Texts: Regina Teixeira de Barros and Taisa Helena P. Linhares. Exhibition catalogue, Centro Universitário Maria Antônia da Universidade de São Paulo. São Paulo: Cosac & Naify; Centro Universitário Maria Antonia da USP, 2002. Blistne, Bernard, and Véronique Legrand, orgs. Poésure et Peintrie: «d'un art, l'autre». Exhibition catalogue, Centre de la Vieille Charité, Marseille, 12 February – 23 May 1993. Marseille: Réunion des Musées Nationaux, Musées de Marseille, 1993 [1998?]. Brito, Ronaldo. Amilcar de Castro. Fotos Rômulo Fialdini et al. São Paulo: Takano Editora, 2001. Cabral, Isabella, and M. A. Amaral Rezende. Hermelindo Fiaminghi. Artistas Brasileiros, 11. São Paulo: EdUSP, 1998. Campos, Augusto de. “50 anos depois.” Interview with Marcus Augusto Gonçalves. Folha Ilustrada [da Folha de São Paulo], 16 Sept. 2006: E8–9. Campos, Augusto de, Décio Pignatari and Haroldo de Campos, “plano-piloto para poesia concreta.” Noigandres 4 (1958). Rpt. in Campos, Pignatari and Campos, eds., Teoria da Poesia Concreta,1987. 156–58. English: “plano-piloto para poesia concreta / pilot plan for concrete poetry.” Portuguese and English, tr. by the authors. In Solt, ed. Concrete Poetry: A World View.70–72. “pilot plan for concrete poetry.” Tr. Jon M. Tolman. In Richard Kostelanetz, ed. The Avant-Garde Tradition in Literature. Buffalo, NY: Prometheus Books, 1982. 257–58. Campos, Augusto de, Décio Pignatari, Haroldo de Campos. Teoria da Poesia Concreta: Textos críticos e manifestos 1950-1960. 1st ed. 1965. 3rd ed. São Paulo: Brasiliense, 1987. Campos, Haroldo de. “A Obra de Arte Aberta” (orig. 1955). Rpt. in Campos, Pignatari, and Campos, Teoria da Poesia Concreta, 1987. 36–39. Cintro, Rejane, curator. Grupo Ruptura: Revisitando a Exposiço Inaugural. Texts by Rejane Cintrão and Ana Paula Nascimento. Exhibition catalogue, Centro Universitário Maria Antônia da Universidade de São Paulo. São Paulo: Cosac & Naify; Centro Universitário Maria Antonia da USP, 2002. Clüver, Claus. 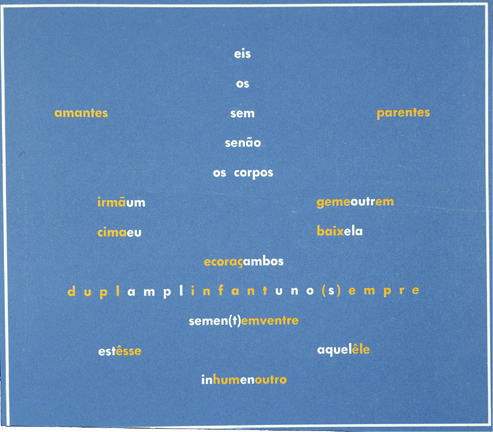 “Augusto de Campos’s ‘terremoto’: Cosmogony as Ideogram.” Contemporary Poetry 3.1 (1978): 38-55. Clüver, Claus. “Brazilian Concrete: Painting, Poetry, Time, and Space.” In Proceedings of the IXth Congress of the Internation­al Comparative Literature Association. Vol. 3: Literature and the Other Arts. Ed. Zoran Konstantinović, Ulrich Weisstein, and Steven Paul Scher. Innsbruck: Innsbrucker Gesellschaft zur Pflege der Geisteswissen­schaften, 1981. 207–13, ill. 44–49. Clüver, Claus. “Concrete Poetry: Critical Perspectives from the 90s.” In K. David Jackson, Eric Vos, and Johanna Drucker, eds..Experimental – Visual – Concrete: Avant-Garde Poetry Since the 1960s. AvantGarde Critical Studies, 10. Amsterdam–Atlanta, GA: Rodopi, 1996. 265–85. Clüver, Claus. “Iconicidade e isomorfismo em poemas concretos brasileiros.” Trans. André Melo Mendes. Dossiã: 50 anos da poesia Concreta. Ed. Myriam Corra de Araújo Ávila et al. O eixo e a roda (FALE, Universidade Federal de Minas Gerais), no. 13 (July–Dec. 2006): 19–38. Clüver, Claus. “Klangfarbenmelodie in Polychromatic Poems: A. von Webern and A. de Campos.” Comparative Literature Studies 18 (1981): 386-98. Clüver, Claus. “On Intersemiotic Transposition.” In Art and Literature I, ed. Wendy Steiner. Topical issue. Poetics Today 10.1 (1989): 55–90. Clüver, Claus.“The ‘Ruptura’ Proclaimed by Brazil’s Self-Styled ‘Vanguardas’ of the Fifties.” In Neo-Avant-Garde. Ed. David Hopkins. Amsterdam and New York: Rodopi, 2006. 161–96. Clüver, Stefan Ferreira. “Viewing Notes by the Filmmaker” on vai e vem, a film from the poem of José Lino Grünewald, 1980/1998. 1998, unpublished. Concreta ‘56: a raiz da forma_ [ital.]. Exhibition catalogue, Museu de Arte Moderna, 26 September – 10 December, 2006. São Paulo: Museu de Arte Moderna, 2006. Costa, Helouise, curator. Waldemar Cordeiro: A Ruptura como Metáfora. Texts: Helouise Costa and Vivian Boehringer. Exhibition catalogue, Centro Universitário Maria Antônia da Universidade de São Paulo. São Paulo: Cosac & Naify; Centro Universitário Maria Antonia da USP, 2002. Cordeiro, Waldemar. “O objeto.” AD: Arquitetura e Decoração (São Paulo), No. 20 (December 1956): np. Gullar, Ferreira. “O Grupo Frente e a Reação Neoconcreta / Frente Group and the Neo-Concrete Reaction.” In Amaral, ed., Arte Construtiva no Brasil, 143–81. Gullar, Ferreira. “Manifesto Neoconcreto,” Jornal do Brasil (Rio de Janeiro), 22 March 1959. Rpt. (with English translation) in Amaral, ed., Arte Construtiva no Brasil, 270–75. Museu de Arte Contemporânea da Universidade de São Paulo. Catálogo Geral das Obras. Orientação: Walter Zanini. São Paulo: MAC/USP, 1973. O Museu de Arte Contemporânea da Universidade de São Paulo.São Paulo: Banco Safra, 1990. No. 1, 1952; No. 2, 1955; No. 3, 1956; No. 4, 1958 (folder with poster poems). Antologia Noigandres 5: do verso ã poesia concreta. São Paulo: Massao Ohno, 1962. Pape, Lygia, curator. Projeto Construtivo Brasileiro na Arte (1950–1962). Exhibition catalogue. Museu de Arte Moderna do Rio de Janeiro / Pinacoteca do Estado de São Paulo, 1977. 20 pp. Pedrosa, Mário. “Paulistas e Cariocas” (Feb.1957). Rpt. in Amaral, ed. Projeto Construtivo Brasileiro na Arte, 136–38. Pérez-Barreiro, Gabriel. 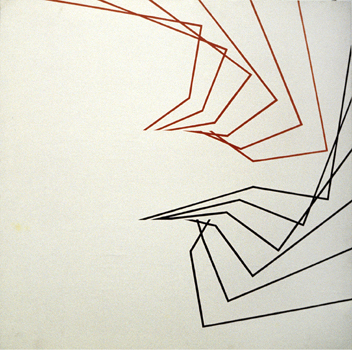 “Geraldo de Barros, Função diagonal [Diagonal Function], 1952.” In Pérez-Barreiro, ed. The Geometry of Hope, 128–30. Pérez-Barreiro, Gabriel, ed. The Geometry of Hope: Latin American Abstract Art from the Patricia Phelps de Cisneros Collection. Exhibition catalogue, Blanton Museum of Art, U Texas, Austin, 20 Feb. – 22 April 2007, and Grey Art Gallery, NYU, 12 Sept. – 8 Dec. 2007. Austin, TX: Blanton Museum of Art and Fundación Cisneros, 2007. Pignatari, Décio. “Arte concreta: objeto e objetivo.” AD: Arquitetura e Decoração (São Paulo), No. 20 (December 1956): np. Sacramento, Enock. Sacilotto. Photos: Sergio Guerini et al. São Paulo: E. Sacramento, 2001. Solt, Mary Ellen, ed. A World Look at Concrete Poetry. Topical double issue. Artes Hispanicas / Hispanic Arts 1.3-4 (1968). Rpt. as M.E. Solt, ed. Concrete Poetry: A World View. Bloomington: Indiana University Press, 1970. Salzstein, Sônia. Franz Weissmann. Espaços da arte brasileira. São Paulo: Cosac & Naify, 2001. Silva, Fernando Pedro da, and Marília Andrés Ribeiro, coord. Franz Weissmann: Depoimento. Organização e entrevista do livro: Marília Andrés Ribeiro Belo Horizonte: C/ arte, 2002. Stolarski, André. Alexandre Wollner e a formação do design moderno no Brasil . São Paulo: Cosac & Naify, 2005. Fig. 1: Waldemar Cordeiro (1925-1973), Movimento (Movement), 1951. Tempera on canvas, 90.2 x 95 cm. São Paulo: Museu de Arte Contemporânea, Universidade de São Paulo (USP). Fig. 2: Luiz Sacilotto (1924-2003), Concreção (Concretion), 1952. Oil on canvas, 50 x 70 cm. São Paulo: Coll. Ricard Akagawa. 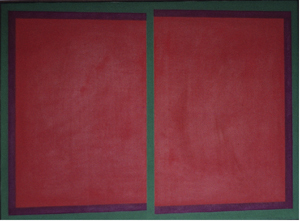 Left: Desenvolvimento de um quadrado [Funço diagonal] (Development of a Square [Diagonal Function]), 1952. Industrial lacquer on cardboard, 60 x 60 x 0.3 cm. Coll. Patricia Phelps de Cisneros. Fig. 4: Maurício Nogueira Lima (1930-1999), Objeto rítmico No. 2 (Rhythmic Object No. 2), 1953. “Pintura” on eucatex, 40 x 40 cm, São Paulo: Coll. Luiz Sacilotto. Fig. 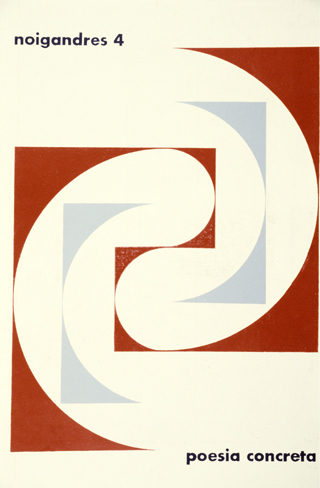 5: Hermelindo Fiaminghi (1920-2004), Círculos com movimento alternado (Circles with Alternating Movement), 1953. Enamel on eucatex, 60 x 35 cm. Fig. 6: Cover, ad: arquitetura e decoração, No. 20, December 1956. Fig. 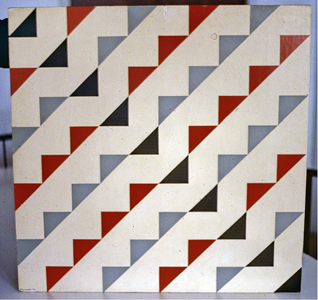 7: Fiaminghi, Triângulos com movimento em diagonal (Triangles with Diagonal Movement), 1956. Enamel on eucatex, 60 x 60 cm. São Paulo: Coll. Ronaldo Azeredo. Fig. 8: Lothar Charoux (1912-1987), Desenho (Design), 1956. Ink on paper, 49.3 x 49.2 cm. São Paulo: Museu de Arte Contemporânea, USP. Fig. 9: Judith Lauand (b. 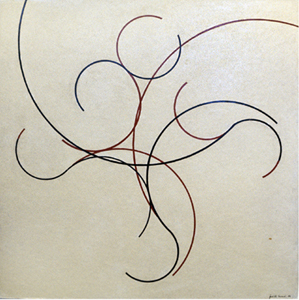 1922), Variação em curvas (Variation in Curves), 1956. Enamel on eucatex, 60 x 60 cm. Fig. 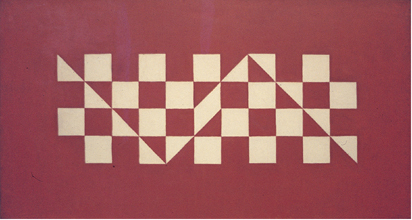 11: Alfredo Volpi (1896-1988), Xadres branco e vermelho (White and Red Checkerboard), 1956. Tempera[?] on canvas, 53 x 100 cm. São Paulo: Coll. João Marino. Fig. 13: Luiz Sacilotto, Concreção 5624, 1956. Oil on aluminum, 36.5 x 60 x 0.4 cm. Coll. Renata Feffer. Fig. 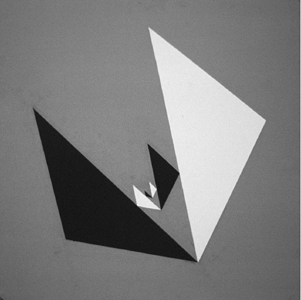 14: Waldemar Cordeiro, Idéia visível (Visible Idea), 1957.¨Tinta e massa s-compensado, 100 x 100 cm. São Paulo: Pinacoteca do Estado. Fig. 15a: Augusto de Campos (b. 1931), “eis os amantes” (1953/55) , from Solt, ed., Concrete Poetry, recto of inside cover page. Fig. 15b: Augusto de Campos, “here are the lovers,” trans. 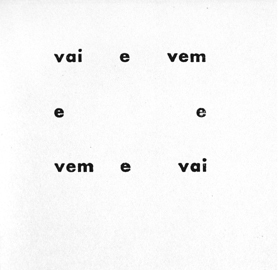 A. de Campos, Marcus Guimarães and Mary Ellen Solt , from Solt, ed., Concrete Poetry, verso of inside cover page. Fig. 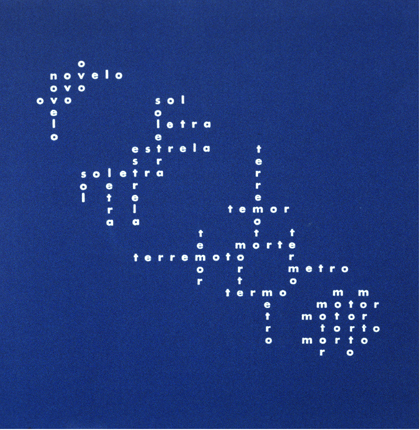 17: Augusto de Campos, “terremoto” (1956), version published in Solt, ed., Concrete Poetry, np. Fig. 20: Luiz Sacilotto, Concreção 6048, 1960. Oil on canvas, 60 x 120 cm. São Paulo: Pinacoteca do Estado. Fig. 21: Ronaldo Azeredo (1937-2006), “ruasol,”, Noigandres 4, 1958. Fig. 25: Mauricio Nogueira Lima, 1953. Coll. Décio Pignatari. Fig. 26: Hermelindo Fiaminghi, 1956. Coll. Décio Pignatari. Fig. 27: Alfredo Volpi, two paintings. Coll. Ronaldo Azeredo. Fig. 28: Luiz Sacilotto, 1958. Coll. Ronaldo Azeredo. Fig. 30: Weissmann, Coluna, 1958. Painted iron, 280 x 110 x 75 cm. São Paulo: Museu de Arte Contemporânea, USP. Photo: Claus Clüver, 1977. Fig. 31: Franz Weissmann, Trãs pontos (Three Points), 1958. Painted iron, 120 x 160 x 160 cm. Photo: Claus Clüver, 1977. Fig. 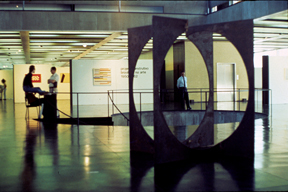 32: Installation shot, “Projeto Construtivo Brasileiro na Arte (1950–1962)”, Rio de Janeiro, Museu de Arte Moderna, 1977, with Franz Weissmann, Círculo inscrito num quadrado (Circle Inscribed in a Square), 1958. Painted iron, 100 x 100 x 100 cm. Photo: Claus Clüver. Fig. 33: Amilcar de Castro (1920–2002), steel sculpture displayed in front of the Palácio das Artes in Belo Horizonte, Minas Gerais, in 1976. Photo: Claus Clüver. Fig. 34: Amilcar de Castro, steel sculptures displayed in the courtyard of the Palácio das Artes in Belo Horizonte, Minas Gerais, in 1976. Photo: Claus Clüver.